The hallmark of this work is the American Human Development Index, an alternative to GDP and other money metrics that tells the story of how ordinary Americans are faring and empowers communities with a tool to track progress over time. The Index is comprised of health, education, and income indicators and allows for well-being rankings of the 50 states, 436 congressional districts, county groups within states, women and men, and racial and ethnic groups. Through national and state reports, thematic briefs, and interactive websites such as DATA2GO.NYC, Measure of America aims to breathe life into numbers, using data to create compelling narratives that foster greater understanding of our shared challenges and greater support for people-centered policies. The Project was founded in 2006, and became an initiative of the Social Science Research Council (SSRC) in 2008. “This book, with its well-written narratives and understandable graphics, is a clear concise picture of our communities. Useful for a variety of research purposes, this holistic look at the country should be required reading for the current administration and public policy makers.” — Karen Pangallo, American Association of School Librarians. “For the Secretaries of Labor, Education, Health, Housing, Transportation, and White House staffers on domestic policy, a highly useful gift would be: The Measure of America: American Human Development Report 2008-2009…It should sit on the desk of all domestic officials and serve as both a benchmark and a roadmap for progressive reforms in the Obama administration.” — Derek Shearer, Professor of Diplomacy at Occidental College and former US ambassador, “An Obama Holiday: What to Give a Progressive President and his Team.” – Huffington Post. How does your area stack up? 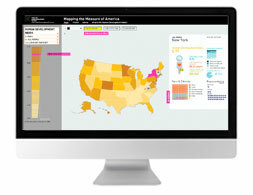 Create maps for over 100 human development indicators.